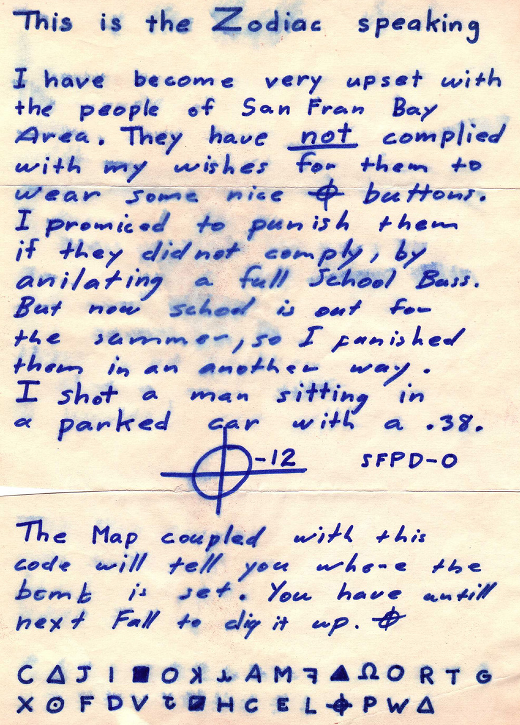 Below is just one of many letters sent to the San Fransisco Police Department by the self-titled Zodiac Killer, a person whose identity is still unknown. This particular taunt was received June 26, 1970. 5 deaths have been officially attributed to the Zodiac Killer whilst the killer claimed to have actually murdered 37 people. The case is still open. I have become very upset with the people of San Fran Bay Area. They have not complied with my wishes for them to wear some nice (symbol) buttons. I promised to punish them if they did not comply, by anilating a full School Buss. But now school is out for the summer, so I punished them in another way. I shot a man sitting in a parked car with a .38.